You're choosing a software program. How important is honesty to you? This page is not a disparagement of a vendor - just a full accounting of all of the things that you certainly would not like if you knew about them prior to purchase, which is why the vendor purposely avoids placing all of them on one page, like this one. There is no written disclosure of all possible fees and actually the (deliberate) structure of the website requires 22 mouse clicks (at last count) to unearth most of the fees and all that is stacked against you. Here's a synopsis: 'The initial cost is double and triple that of other programs that will probably suit your needs. Copies of the software are $295 and for additional stores the cost is 80% of the original price. Hardware markups are ridiculous and shipping is tacked on at the end of the order. Hardware support is limited to 30 days then $100 per hour thereafter. The annual fee and other fees are routinely increased over time so selecting this software locks you into rising costs. If you ask you are told you can resell the software but the condition is not readily disclosed which is 'the vendor will determine the value of the software and will assess a 50% commission' pretty much rendering the value of resale to zero. See how this is working? 'Training' and 'how-to questions' are not included in the annual fee and are billed at $100 per hour. Need help with your computer, Windows, networking, Quickbooks, scanner, receipt printer, label printer, antivirus, data? Fees range from $50 to $200 with this blank-check policy: "All prices are STARTING PRICES with no guarantees. The nature/complexity of the issue could generate additional charges. Minimum of one hour." Any business trying to earn your business has an obligation to disclose every possible fee, rate hike and adverse policy before you sign up. If you haven't visited the website or talked to a sales rep, you might want to do that first then come back here, to prove for yourself that 1) there are several potential fees, rate hikes and adverse policies after purchase and 2) you won't be told about them prior to purchase. Ask for a detailed list of every possible fee. It will not be provided. This vendor has the benefit of 24 years of experiences with how people feel about being deceived. Apparently that knowledge has not led to fair pricing and policies but to deliberate and unlawful advertising and marketing practices. Now, let's do something the vendor refuses to do: Disclose! 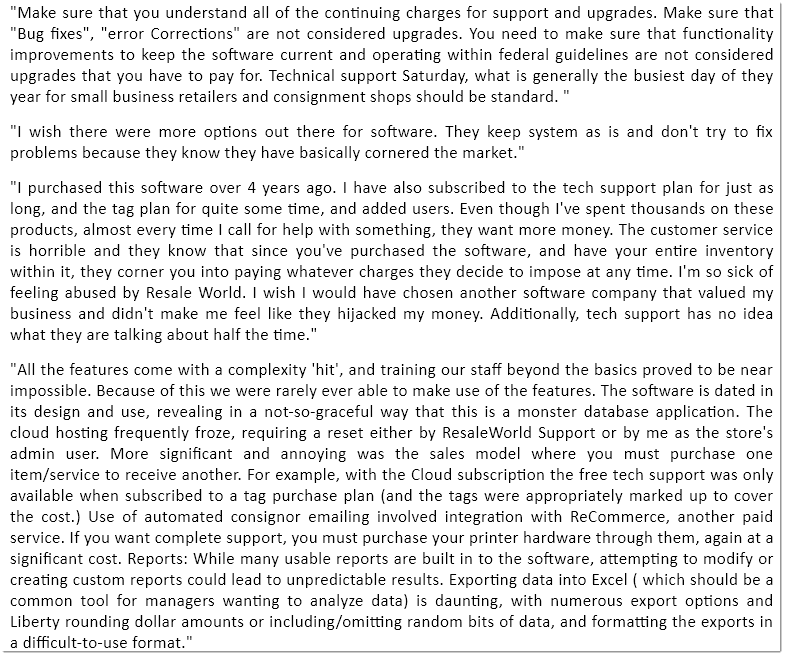 The 'About Our Competition' page has a great example of the degree of dexterity the vendor possesses when it comes to fees and policies: "...can buy our software and never spend another dime..."
After you're finished reading this page, come back to "Watch out for hidden fees!" again and note the difference in your blood-pressure. For starters, the software is extremely over priced at $1,095. That's the first copy of the software. When you expand and need to put more computers in use, each copy of the software will be $299 (increased recently from $295), so installing the software on 4 computers would cost $1,992. "How To" questions, walkthroughs or anything deemed a "Training" call". In addition to paying the annual fee, there are more fees for simple help. So much for a big helping of support included in the $1,000+ price. The list continues going up to $194.95 per MONTH for 25 users. While most of us won't go there, many of us will have up to 5 users, so the 'support plan' would be costing $611.40 per YEAR. Keep in mind that this is today's price. Over the years the cost of the 'support plan' has increased often and considerably. In July, 2014, for example, the single-user fee was $13.95. The increase of $3 is a whopping 23%! It wouldn't take long before 'annual support fees' exceed the initial cost of the software! "The following are covered during your initial (30 days) printer support period: •The installation of the printer •The configuration of the printer •Verification of a successful installation via a Windows Test Page •The configuration of the Liberty application"
You are reading that correctly: You can over-pay for a common label printer and if you need help after 30 days from the company that sold the printer to you - you'll pay again! Oh, you could buy a 1-year support plan for the $469 printer for another $75 PER YEAR! The question begging to be asked is, "What would we be paying for?" Then we should think of the 'support plan' as 'insurance' and we should find comfort in knowing that this huge over-charge buys peace of mind? Personally I would be more pacified if I didn't need support and didn't have to pay for something I shouldn't need and don't want! "We offer weekend Emergency Support (something the other guys don't offer) for our customers. You're not stranded come 5 PM on Friday - not when you're a Resaleworld customer. Emergency weekend support covers the following: You are seeing errors in Liberty that are preventing you opening the Liberty application. You are seeing errors in Liberty that are preventing you from adding items. You are seeing errors in Liberty that are preventing you from ringing up sales. You are seeing errors in Liberty that are preventing you from synchronizing items with reCommerce. You are seeing errors in Liberty that are preventing you from synchronizing items with eBay. This emergency line is intended to provide a channel of communication to our customers that are in dire need of support. While we will provide support to all of our customers during normal business hours (M-F, 9:00 AM-6:00 PM, EST), we must restrict the use of this line to true emergencies. Issues with printers/bar code scanners, "how to" questions, ordering supplies, etc. will have to be reserved for calls during normal business hours. Emergency support hours are Monday through Friday from 6 PM until 8 PM and on Saturdays from 10 AM until 2 PM EST. Just dial the regular Support line - (800) 785-4800, you will be prompted to connect to Emergency Support during the Emergency Support hours." It's unlikely that anyone at RSW took the time to determine every software provider's weekend service policy and I know for fact that the folks at BCSS have been available, seemingly, 24/7 (even on holidays) making the offer of "Emergency Service, 6 PM until 8 PM and Saturdays 10-2" stand out for what it really is: a token gesture and an excuse to charge even more. Moreover I haven't been able to find out what the extra charge, if any, is for "emergency service". "Never spend another dime". Right, and if you don't pay the annual service fee, your arm will get twisted until you do. Reports have it that if/when you have an issue and call for help, the first question asked is, "Did you pay the annual support fee? No? Well, go post your troubles in our forum and wait for an answer." You can handle that? Ok, let's add the fact that you will be denied updates to the software if you don't pay the annual fee. Really? Just call the 'sales department' and ask about the competition. The software provider you chose will be a business partner for years to come. How comfortable can you be with a vendor so obviously intent upon piling on fees and making no effort to disclose all possible expenses in one document prior to purchase?